In 2008, journalist Bill Bishop achieved the kind of notice that authors dream about. His book, The Big Sort: Why the Clustering of Like-Minded America Is Tearing Us Apart, was mentioned regularly during the presidential campaign; most notably, former president Bill Clinton urged audiences to read the book. Bishop’s thesis is that Americans increasingly choose to live in neighborhoods populated with people just like themselves. In turn, these residential choices have produced a significant increase in geographic political polarization. Bishop does not contend that people consciously decide to live with fellow Democrats or Republicans; rather, political segregation is a byproduct of the correlations between political views and the various demographic and lifestyle indicators people consider when making residential decisions. Whatever the cause, Bishop contends that the resulting geographic polarization is troubling and dangerous. We do not doubt that various kinds of sorting are occurring in the United States—as they have in the past and no doubt will in the future. Most important, political science research has shown that during the past three decades party sorting has occurred—liberal-minded Americans have increasingly made the Democratic Party their home, and conservative-minded Americans have increasingly gravitated to the Republican Party. Yet claims about geographical sorting have always struck us as somewhat questionable. Residential mobility notwithstanding, do the citizens of, say, Massachusetts and Mississippi differ more today than they did in 1950, before the jet plane, the interstate highway system, broadcast television, and other economic and cultural homogenizing influences? To be sure, states are gross units of analysis, but descending to lower levels, a half-century ago when the United States was still largely a country of small towns and cities, did blue-collar union Democrats who worked in the mines and factories interact with white-collar Republican managers and professionals more than they do today? A Democratic gun lover might vote for George W. Bush in 2000 without becoming a Republican. Despite the opinions of various reviewers on Amazon.com and in the popular media that The Big Sort is thorough, systematic, and well researched, most academic researchers would conclude the opposite. We believe that the case for geographic political sorting has not been made. Indeed, using Bishop’s standard, the data suggest the opposite: geographic political segregation is lower than a generation ago. We also make the case that although the concerns expressed by Bishop are legitimate—that various factors may be operating to make Americans more culturally inbred than a generation ago—geographic political sorting has little or nothing to do with that development. The most serious problem with Bishop’s analysis is the reliance on presidential election returns. Although presidential voting returns obviously are an important indicator of political preferences, they are frequently inconsistent with other valid indicators of political preference such as voter registration and election returns for other offices. For example, in the 2004 election, George W. Bush carried Montana by 20 points, but Montana voters elected a Democratic governor. Even more striking, Montana voters approved a prohibition of gay marriage by a 67 percent majority along with a permissive medicinal-marijuana initiative by a 62 percent majority. In contrast to presidential election returns that are highly dependent on the identities of the contending candidates and the conditions under which they occur, a more general and undoubtedly more stable measure of partisan preference is the standard attitudinal measure of party identification. A Democratic gun lover might vote for Bush in 2000 without becoming a Republican. Similarly, a Republican windsurfer might vote for John Kerry in 2004 without becoming a Democrat. But even state-level measures of party identification did not become available until the 2000s, and reliable figures are not available for smaller units even now, so using party identification to study temporal changes in neighborhood homogeneity is impossible. A behavioral measure of party identification—voter registration—however, is available at the county level—the level from which Bishop’s evidence comes. The drawback of voter registration is that not all states have partisan registration—twenty-nine states plus the District of Columbia have it today and only twenty-three had it in the mid-1970s. Fortunately for our purposes, scholars who have worked closely with these data have concluded after a number of validity tests that the data are quite representative of the entire country. Fifty years ago, did blue-collar union Democrats who worked in the mines and factories interact with white-collar Republican managers and professionals more than they do today? An examination of trends in voter registration in American counties leads to conclusions about geographic polarization quite different from those based on presidential election returns. First, in recent decades there has been a significant increase in independents. In 1976 more than 70 percent of the counties in partisan registration states had 10 percent or fewer independents. By 2004 the situation had reversed: more than 70 percent of the counties had 10 percent or more independent registrants. Average independent registration increased from 12 to 18 percent, average Republican registration increased from 33 to 39 percent, and average Democratic registration fell from 55 to 42 percent. The proportion of counties where Republicans have a 20 percent or more registration edge (i.e., a “landslide” in Bishop’s term) almost doubled, rising from 7 to nearly 13 percent, while the proportion of counties where Democrats have such a large margin halved, falling from 38 to 18 percent. Thus, at the county level what has occurred is not counties increasingly polarizing into Democratic and Republican categories, but rather counties becoming less Democratic and more Republican and independent. 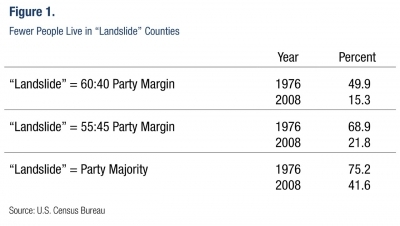 If we define landslide counties according to their voter registration rather than their presidential vote, the proportion of the American population living in landslide counties has fallen significantly, from about 50 to 15 percent. Figure 1 shows that counties in the United States have become increasingly politically heterogeneous, not increasingly homogeneous. Does our analysis prove that political residential segregation is not occurring? No. That is not our position. We are simply pointing out that Bishop’s sweeping argument about geographic political sorting has little or no empirical foundation. The simple fact is that it will take much more detailed research to settle questions about geographic sorting one way or the other. In particular, to examine the subject of residential polarization in a systematic manner requires data at a much lower level than the county level. One of the authors of this essay lives in New York County, New York, where neighborhoods range from the Upper East Side and SoHo to Harlem and Washington Heights. The other lives in San Mateo County, California, where neighborhoods range from the Woodside estates of Silicon Valley billionaires to the Redwood City bungalows of Mexican immigrants. No county-level figures can capture the disparate political textures of these areas, as well as thousands of others in the United States. We turn now to a second question: if subsequent research at the neighborhood level were to find that geographic sorting in fact is occurring, would such a finding point to a serious problem for American democracy? The fears Bishop expresses are shared by many: “Like-minded homogeneous groups squelch dissent, grow more extreme in their thinking, and ignore evidence that their positions are wrong.” We agree that such behavior is highly problematic for democratic politics, and if realized, a matter of serious concern. Neighborhoods are important centers of American life. The residents of American neighborhoods talk to each other. Politics is an important topic of their discussions. If these assumptions hold, then the results of social-psychological experiments on group pressure may well apply. But many respected scholars believe that the problem with American life today is precisely that the preceding assumptions do not hold. A decade ago, Robert Putnam published his magisterial work Bowling Alone. Putnam found that Americans had become much less socially engaged than in earlier decades. They were strikingly less likely to join traditional community-based organizations such as the Elks, Lions, Eagles, Kiwanis, Rotary, Masons, Grange, PTA, American Legion—and a long list of other groups that had bound together previous generations of Americans. Putnam concluded that “active involvement in clubs and other voluntary organizations has collapsed at an astonishing rate, more than halving most indexes of participation within barely a few decades.” The decline was general—civic, political, religious, and “informal.” In the latter category Putnam included neighborhood connections: “When compared with neighborliness in the mid-1950s, neighborhood ties in the 1990s are perhaps less than half as strong.” Putnam identifies suburbanization as one of the contributing factors to the decline of neighborliness. A majority of the American population now is suburban, more than twice the figure in 1950. According to sociologists, housing patterns have functioned to isolate families and residents from the street, from other neighbors, and from the community at large, and helped promote a culture of privatism. Contemporary American neighborhoods are not the first places one would look for the operation of strong social pressures. Even if neighborhoods were becoming more homogeneous politically, any resulting tendency for neighborhoods to squelch dissent and enforce conformity would be at least partly offset by the fact that their denizens were less likely to be involved in neighborhood affairs, and consequently less likely to be sensitive to any purported neighborhood consensus. If a dissident regards her neighborhood as little more than a place to sleep, she can hardly be intimidated into adhering to the neighborhood consensus—if she knew there was one. Counties aren’t getting more polarized: they’re becoming less Democratic and more Republican and independent. According to a 2005 Georgetown University survey, almost two-thirds of Americans report that they could not name more than one out of four residents of their neighborhoods. Almost a majority report that they could not name more than one out of ten. Evidently American neighborhoods in the 2000s are not places where “everyone knows your name.” For most Americans a close connection to the neighborhood is something seen only in old movies. Today, women are in the labor force, not conversing over the backyard fence. In many places the neighborhood school is a relic of the past. People today work long hours, maintain busy after-work schedules, and are more likely to spend leisure time in solitary pursuits than they are to talk to their neighbors on front porches—few of which exist in any case. The clear implication is that contemporary Americans are unlikely to know the political inclinations of their neighbors, let alone be cajoled and bullied into adopting them. Even if people can guess the political inclinations of their neighbors on the basis of lifestyle correlations (e.g., are there beer cans or chardonnay bottles in the curbside recycling bins? ), they are unlikely to feel much social pressure from nameless faces who happen to live down the street. 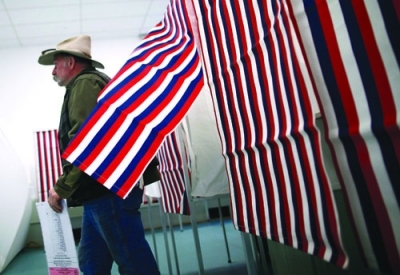 A man emerges from a voting booth in Deerfield, New Hampshire, after casting his vote in the primary election in January. Research suggests that although Americans may be more culturally inbred than a generation ago, geographic political sorting has little or nothing to do with it. 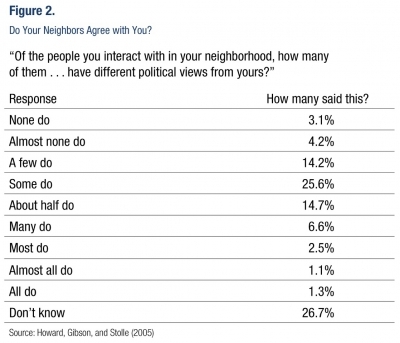 The Georgetown University survey also included a question “When you talk to your neighbors, how often do you discuss political issues?” Evidently American neighborhoods are not hotbeds of political debate. An absolute majority of Americans replied “never,” apparently not only still adhering to the old admonition not to discuss politics or religion at the dinner table, but generalizing it to broader arenas. An additional 30 percent said “rarely.” Fewer than two in one hundred Americans said “usually.” If these two individuals can create and enforce conformity in their neighborhoods, they are persuasive indeed. Of course, one does not need to talk to a neighbor to infer political inclinations. If one’s neighbor regularly shoots groundhogs in her vegetable garden, the chances are better than even that she is a Republican. Similarly, if your neighbor does yoga in his backyard, the chances are better than even that he is a Democrat. People can infer (albeit with considerable error—according to the exit polls, more than 35 percent of gun owners voted for John Kerry in 2004) the partisanship of their neighbors without ever having a conversation about politics. Happily, the Georgetown University survey also included a question (figure 2) that would tap such possibilities: “Of the people you interact with in your neighborhood, how many of them . . . have different political views from yours?” Although more than four out of five respondents have just said that they rarely or never discuss politics with their neighbors, three-quarters of them at least are willing to hazard a guess about their neighbors’ views. The majority who do so believe that their political environment is not homogeneous; a majority of Americans believes that at least one out of four neighbors have different views and a quarter believe that half or more of their neighbors have political views different from the respondent’s. Today’s Americans don’t see themselves as swimming in a sea of likeminded people. The fact that so many Americans perceive their neighborhoods as politically diverse may partly explain their reluctance to talk politics. Members of the political class may be willing to end friendships over political disagreement, but politics does not rank so highly for most people. Indeed, political affiliation appears to be a surprisingly unimportant part of most people’s self-image. A 1995 International Social Science Program survey asked: “We are all part of different groups. Some are more important to us than others when we think of ourselves. In general, which in the following list is most important to you in describing who you are?” Of ten “groups” listed, political party came in dead last: only five respondents out of more than twelve hundred thought of themselves first as partisans, and only fifty-one put party among their top three reference groups. If a dissident regards her neighborhood as little more than a place to sleep, she can hardly be intimidated into following the neighborhood consensus—even if she thought there was one. In sum, neighborhoods are not important centers of contemporary American life. Americans today do not know their neighbors very well, do not talk to their neighbors very much, and talk to their neighbors about politics even less. And they do not see themselves as swimming in a sea of like-minded people who have intimidated or cast out anyone who believed otherwise; they are aware that their neighbors differ politically. Even if geographic political sorting were ongoing, its effects would be limited by the preceding facts about contemporary neighborhood life. Our conclusions can be stated in a single compound sentence. There is no evidence that a geographic partisan “big sort” like that described by Bishop is ongoing, and even if it were, its effects would be far less important than Bishop and those who support his thesis fear. We do not categorically deny that subgroups of Americans are becoming more like-minded, that they are becoming increasingly ideologically inbred, and that they have difficulty comprehending people unlike them. There is evidence that this is occurring among members of the political class, a development we find troubling. Yet, however important or troubling they may be, such trends are independent of geographic political sorting. A Texas Democrat surrounded by “drill, baby, drill” Republicans can still sit down in the privacy of his living room and write a check to the Environmental Defense Fund. None of his neighbors need know; his reference group is virtual. That is a more common example of political activity today than joining a neighborhood demonstration. Advances in communications technology have made geographic location less important than in earlier eras. Presidential candidates campaigning in Iowa spend money raised from supporters scattered throughout the entire United States, to state only the most obvious example. 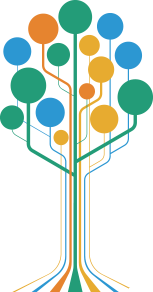 The simple fact is that a neighborhood big sort could occur without changing either the everyday lives of most Americans or the political process that prevails today. Reprinted by permission of PS: Political Science and Politics. © 2012 American Political Science Association. All rights reserved.